Touria El Glaoui, 39, is the Founding Director of 1:54 Contemporary African Art Fair, a platform for artists, galleries, curators, independent art centres and institutions dedicated to promoting African and Africa-related art. Established in 2013, 1:54 takes place annually in October at Somerset House in London, bringing together exhibitors from countries such as Nigeria, Kenya, South Africa, France, Italy, Germany, UK and the US. El Glaoui, who lives in London, has co-curated several exhibitions with her father, the Moroccan artist Hassan El Glaoui who was famously discovered and encouraged to attend art school by Winston Churchill. Here, she explains how she did it. 1:54 draws together galleries, curators, artists, art centres and museums both from Africa and working on Africa-related projects to promote art by established and emerging talent to an international audience. By taking place during Frieze Week (one of the world’s leading contemporary art fairs), 1:54 builds on the burgeoning popularity of contemporary African art. It presents a rare opportunity to explore the emerging market and acquire works, in an environment supported by some of the most influential people and organisations in the world. There is also a ‘critical conversations series’ to stimulate discussion and debate with some of art’s most inspirational thinkers. The programme comprises lectures, talks, film screenings and panel discussions. What motivated and inspired you to start your business? Being the daughter of an artist in Morocco, I have always been exposed to art and its discourse. My father encouraged me to engage in a number of art forms. My earlier work allowed me to travel extensively to different African countries, so I would immerse myself in the art scenes and ecology as I went. That’s what motivated me to initiate the fair and give others the chance to delve into the African art scene. I piloted the idea to peers and advisors from the art industry to see whether there would be demand. I also did vast amounts of research – knowing your market is vital. How have you raised awareness? 1:54 had a limited marketing and communications budget. By reaching out to influential people, we attracted press attention. During the week of the first fair, last year, word of mouth seemed an effective tool in propagating excitement, which is turn, encouraged audiences to visit. The hardest task has been raising awareness and finding appropriate sponsors to support the project. It’s a process that requires a sensitive and considered approach – targeting the right people, in the right way. Discuss and work through the different possibilities. There are always alternatives. I enjoy the autonomy and being at liberty to follow your instincts. I work with a great team who are passionate and very much engaged. By thinking about the response we’ve already had. Hearing that 1:54 has challenged the perception of contemporary African art and being able to identify more artists working and living in Africa, definitely fuels our impetus. What advice would you give to other budding entrepreneurs? Securing a source of revenue, or funding, upfront is more productive than consistently having to find sources along the way (although not necessarily simple). It feeds confidence into your project – for yourself, your team and your customers. Break the concept down and think about alternative methodologies and approaches I could adopt. Losing those that I care deeply about. Initiate 1:54 Contemporary African Art Fair. To be true to yourself and do something you love. That the projects your time and energy is invested into should inspire you. It doesn’t matter how much you plan, the outcome is always something other than what you anticipated. Discussions with professionals and friends from the industry. 1:54 returns to London on 16 – 19 October at Somerset House. A woman looks at ‘Child Skull’ by south African artist Walter Oltmann, October 23, 2013. — AFP picLONDON, Oct 16 — Despite sparse resources and limited institutional support, the world will soon wake up to Africa’s ingenious new artists, according to some of the continent’s leading exponents taking part in London’s Contemporary African Art Fair. The four-day event — the largest such fair outside Africa — opens today and showcases the work of over 120 artists in the grand setting of Somerset House in the heart of the British capital in a bid to reach a global market. Some 27 galleries from around the world are represented at “1:54” — named after the number of countries in Africa — and the event has doubled in size since it debuted last year. “What is exciting about 1:54 is showing that Africa is global, we are not in a bubble,” said artist Sokari Douglas Camp, from Nigeria’s Rivers State but based in London. “I don’t understand why Africa has to be separate, it is part of this planet and has been communicating for centuries,” she added, standing next to one of her steel sculptures depicting a person straining under the weight of a bucket full of flowers. Cameroonian Adjani Okpu-Egbe, who dreamed of becoming a footballer before turning to painting, believes that the new wave of African artists can be as important as the continent’s superstar sportsmen in raising its cultural profile. In “The Journey of the Underdog” — painted on four wooden doors — Okpu-Egbe colourfully depicts himself being devoured by a bright red, sharp-toothed monster, meant to represent his domineering father. As with many artists represented at the fair, the 33-year-old is self-taught, giving the collections a fresh sparkle to western eyes, according to 1:54 founder Touria El Glaoui. “There is a lot of influence from their life context and you can see that,” she said. “You can understand what you see, it’s not too conceptual. On the perils of producing work to impress art’s power brokers, Okpu-Egbe said: “The best way to please people is when you are pleased yourself. The painter, who is now based in south London, pinpointed “platforms and resources” as the biggest obstacles facing artists in Africa, calling the dearth of art museums in Cameroon “unbelievable”. Having established the fair in London, founder Touria El Glaoui, daughter of famous Moroccan artist Hassan El Glaoui, said there were plans to bring it to New York and Africa itself. Reflecting the shortage of artistic materials, much of the work on display is fashioned out of recovered materials including charcoal sacks and plastic oil containers, and is heavily influenced by the local environment. “There is a lot of politics, that are very visible and sensible in their production,” explained the event’s artistic director Koyo Kouoh. “There is a great sense of humanity. “It’s not about the artist, it’s a very important voice in portraying society. In October 2013, Touria El Glaoui founded 1:54 Contemporary African Art Fair in London. The fair is a platform for galleries, artists, curators, art centres and museums and aims to bring art from African artists to an international audience. With the fair’s second edition taking place from 16 to 19 October during the capital’s Frieze Week, AMA spoke to El Glaoui about 1:54 and her vision for the future of African art. Where did you get the idea to bring African art to London? I understood there was a very important gap to bridge between African art at auction and artists on the continent and from the diaspora, and the wider contextual framework of art today. I think that there’s not one reason, but several reasons to bring 1:54 to London. When I was travelling to Africa for other jobs, I was seeing some wonderful artists who didn’t get visibility beyond their borders in Africa. Based on what I’ve been doing for my Dad [Moroccan artist Hassan El Glaoui], I’ve always been surprised that he has had two careers: one in Paris with amazing visibility, with international exhibitions, all over Europe and the US; and another career when he decided to go back to Morocco to become an artist there, which was really different from what he had known in Paris. I put those factors together relating to how important the visibility of artists from the continent and from the diaspora is, for example. The only way to improve that was to do it somewhere which was already a very international hub, like London. Is there something particular about London? During the 12 years that I’ve lived there, London has shown that it has such an international culture, a platform for everything — you have museums already showing amazing exhibitions, there are all types of fairs all year long that are taking place. But I think London is very international; especially when it comes to its openness — there are all these different art fairs specialising in different parts of the world like Pinta for South America, and Art 14 having this Asian angle; those take place in London as well. It just made more sense, from a promotional perspective, for all the artists to be in London. Contemporary African art is experiencing a period of growing interest at the moment. Why do you think this is happening now? I believe that it is one of the last continents to be discovered; there has not been this focus on Africa yet, so I think collectors in general have a curiosity and enthusiasm about new talent; young talent and new art. I believe that this is just the normal progression; that at one point the focus will be on Africa, but also that this is happening right now because there’s so much focus on Africa in the media, from an economic perspective — I think both are linked. We have some of the strongest economic growth in African countries right now, and that reflects in the development of different art scenes on the continent and in the diaspora. I really want it to be something that is constant; I don’t like to use the words ‘trend’ or ‘boom’ or creating a ‘buzz’; I prefer to think that this is just a moment that we are having, giving visibility to these African artists; I do hope that it’s not temporary. It correlates to the economic growth in Africa, and the fact that we’re doing this event in an international city like London will give it a lot of focus. People often talk about ‘African’ art, and as is shown by the fair’s name, Africa is actually this huge number of different countries and cultures — so what’s your take on the idea of a shared African identity? Actually, I’m not doing it thinking that there’s a shared identity; the name we chose was to remind people that when they talk about Africa — and this is something that I’ve seen for years, people talk about Africa like it’s a big country — there are 54 countries; first of all, people don’t even know there are 54 countries in Africa, but part of the title was really making sure that they understood that we were trying to showcase as many perspectives as possible from this huge continent, and being able to showcase as many exhibitors and artists as possible. We’re really humble about the fact that we’re definitely not conceptualising the fair as ‘African art’; we’re conscious of the fact that it is a question of us giving the spotlight to those artists who have not been given it before. Today we have more than 100 artists at 1:54, and we’re very proud to be able to say that this is a platform where you can see many artists coming from the continent, showing their work. We are not trying to categorise any artist; we just like giving them the spotlight, creating a stronger platform and rebalancing the number of artists being present internationally. What do you think the future is for the African art market? In the future I want to see a stronger but steadier market for African artists, from the diaspora and from the continent. I know there is a stronger presence already; I started the project around African artists not just for international art fairs, but also for international exhibitions. I hope that this will be a continued evolution; there are different events taking place that I’m really proud of, for example the director of the next Venice Biennale, Quin Wasabi, will be a Nigerian-born director, which is quite an interesting development for contemporary African artists. I believe there will be a much greater presence of African artists, so I’m very curious about seeing the Venice Biennal this year. We also know that there are a lot of exhibitions taking place in international museums in 2015 that will include contemporary African artists, or that will feature solo shows of African artists. This is what we want the contemporary African art scene to be; part of this international art circus. We don’t want to be ‘the African art fair’, we just want to be a platform for discussion. We have a forum here where African artists are present, discussing contemporary African art and its production on the continent or in the diaspora. We want this to be this international rolling ball where people can experience contemporary African art. The fair is taking place during the London Frieze week; what kind of opportunities does this give you? We purposely chose to do 1:54 during Frieze, as the collector base is already present in London for the fair — so for us, there are only benefits. We’re doing it during Frieze so we can open the market to international collectors; we wanted to not only attract African collectors to the fair, but those who may not be familiar with artwork coming from the continent or the diaspora. For us at the moment — we’re a very young fair, this is only our second edition — we only benefit from being at such an event. At the moment I could only tell you good things about this fair taking place around Frieze; since our first edition, they have put us on their VIP website where their VIPs can access 1:54, so we’re really happy with this collaboration and we’re really happy with the people it brings to the fair. How do you select which galleries you will exhibit? We have an open call, like all other fairs, in early February, and we ask all the galleries to apply. We have a selection committee that chooses galleries with a contemporary programme; it’s a much smaller scale than other fairs but we have the same selection process. The galleries are led by the artists they present and their contemporary programme. What do you think the highlights of the fair are going to be this year? We are increasing the number of galleries: we had 15 galleries last year, we have 27 this year, coming from the continent, so we are really proud of that. There is a small video installation from one artist, we have different presentations from different galleries, so the audience will be able to see a larger portfolio of some of the artists. We also have a book store which we are very excited about, where you’ll be able to find publications on African artists. This is our response to something that we’ve been seeing — we usually have a very hard time finding publications on African contemporary artists or artists from the African diaspora, so we’re really proud to have this new book store. We have extended to a new wing as well, and we are also doing a very strong forum of four days this year, which features amazing artists’ talks and debates on contemporary African art. A lot of people came last year — 6,000 visitors — we got a lot of good press saying that our first edition was really successful, and there was a lot of hope for us. I think people will come again this year, and maybe some of those who weren’t able to see it the first year around. I think 1:54 has to be experienced; it’s in the beautiful location of Somerset House; I wish everybody could experience it, because it’s quite different to any other fair. There’s an intimacy between the galleries and their rooms, with their artists, with their audience; it’s quite special, I can’t describe it well enough! There’s such an experience in coming to the fair, seeing all the different works coming from the different countries, coming from the different places in Europe and artists being present to explain their work. It’s a very touching and unique experience. African art giant, 1:54 is set to entertain the city of London with its Contemporary African Art Fair which will begin from 16 to 19 October. This is the second time 1:54 is organizing event of this nature to showcase the world about the best of African art. The event will be held at Somerset House, a historic building and major cultural arts centre in the heart of the city of London. The fair will be open to the public from Thursday 16 to Sunday 19 October, 2014, from 10am to 6pm daily with special attention to customers who wish to transact business by buying some items. Prices for arts that would be display are relative cheaper in order to make it moderate for visitors to be able to purchase some to beautify their homes. Reduced admission fee is also available for 13-18 years and full time students with valid cards but admission for children less than 12 years is free of charge. In touring the event by visitors, there would be excellent introduction to the exhibitors’ galleries and a convenient way to see a tailored view of the fair in a short visit. Public tours are designed for individuals and groups (10 people or less) and are available on Wednesday – Sunday, 15.00 and 17.00 on daily basis. Items to be showcase at the event include galleries, artists, curators, art and museums involved in the preservation of African artifacts. The galleries will be limited to only 27 carefully selected best African arts, telling the story of the African people to new international audience. Officials at 1:54 say the event will also showcase educational and artistic program including lectures, film screenings and panel debates featuring leading international curators, artists and art experts. The objective of including this educational program is to promote Africa related projects activities aimed at projecting the base value of African art by establishing effective mechanism to take care of emerging African art talents and help connect them to international audience. 1:54 is initiated by market developer, Touria El Glaoui under the auspice of Art Africa Ltd to help in the development of art in Africa. The origin of African art is estimated to be more than 6000 years old and it started as wood carvings. But contemporary African art is more of the social surrounding including nature, abstract interpretations of animals, plant life, mystery creatures such as dwarfs and natural designs. ast year, among October’s proliferating events and exhibitions in London, there was a smart new kid on the block. 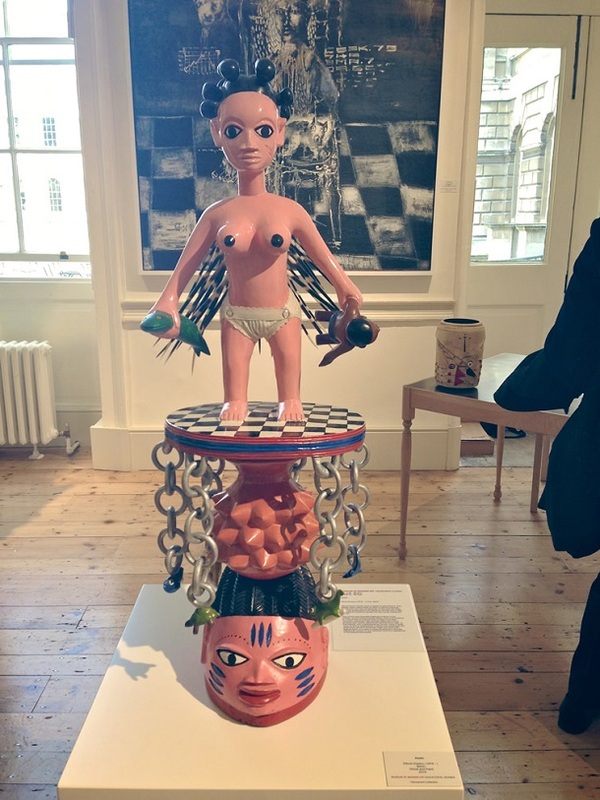 1:54: Contemporary African Art Fair set up shop in the neoclassical apartments of Somerset House, offering a platform to 15 galleries and not-for-profit spaces, with work by 80 African artists. The title hints at the impossibility of representing all 54 countries in one event, but the fair included galleries both in the west and in Africa, showing artists working within Africa and in the wide diaspora. Among 15 galleries only six were from Africa, reflecting the imbalance of power in this nascent market. There were others who, noting the sponsorship of the event by Christie’s, feared that African art might merely be being lined up as a target for the next art investment feeding frenzy. The fair’s founder is businesswoman Touria El Glaoui, daughter of revered Moroccan artist Hassan El Glaoui, and she had high ambitions. She asked the Tanzanian-born, RIBA award-winning British architect David Adjaye to design the fair, and put together an impressive series of talks to provide critical context. Hans Ulrich Obrist was in conversation with Berlin-based Nigerian-born performance artist Otobong Nkanga, whom he presented this June in his 14 Rooms at Art Basel; the 2013 Venice Biennale winner of the Lion d’Or, the Angolan artist Edson Chagas took part. As did Chris Dercon, director of Tate Modern, basking in the afterglow of Tate’s 2013 show of its recent purchase, Benin artist Meschac Gaba’s exuberant Museum of African Contemporary Art. Next week, the fair returns to Somerset House, this time with 27 galleries taking part, 11 from Africa. You will be able to see work by 113 artists from established figures such as Benin artist Romuald Hazoumé, South African Ernest Mancoba (who died in 2002) and London’s Sokari Douglas-Camp, to rising stars such as the Nigerian Peju Alatise (Art Twenty One), Sammy Baloji from the Democratic Republic of Congo (Galerie Imane Farès) and London-based Cameroonian Adjani Okpu-Egbe (Knight Webb Gallery). 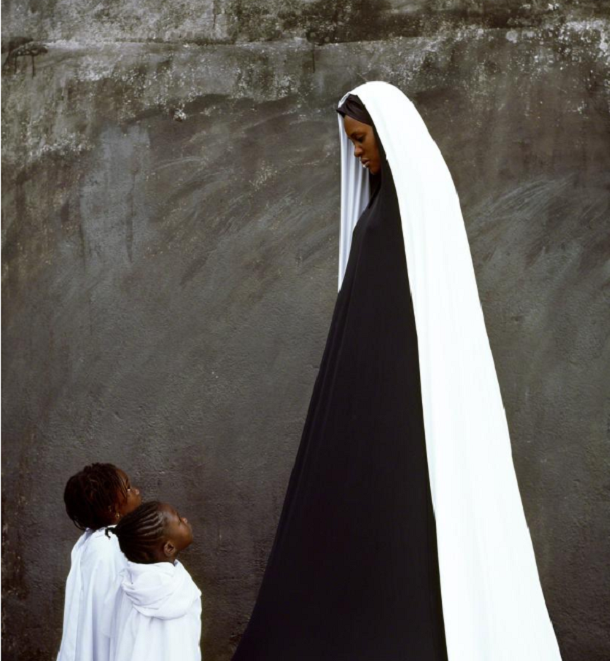 1:54 is just one expression of a current ferment of interest in contemporary African art. It has been a slow build. The Goodman Gallery from South Africa, exhibiting at Frieze, has been in existence since 1966, nurturing the careers of both black and white artists. The October Gallery in London was founded in 1979 to bring attention to African as well as other “transcultural” artists. In 2002, the British Museum’s purchase of the “Throne of Weapons” by Mozambican artist Kester led to collaborations with contemporary African artists, while in 2011 Tate launched its African Acquisitions Committee. The touring exhibition Africa Remix (2004-07) showcased figures such as South African photographer David Goldblatt and the Ghanian master El Anatsui, while in 2007, Hazoumé was awarded the Arnold Bodé Prize at Documenta 12, in Kassel, Germany. Internationally, influential critics such as Okwui Enwezor, now director of Munich’s Haus der Kunst and Simon Njami, curator and co-founder of the art journal Revue Noir, have long fought to create a space for African artists within the global art world. Enwezor’s appointment as curator of the Venice Biennale 2015 is just one indication of the current changed status of African art. Today, however, it is the market, not just the not-for-profit spaces and museums, that is taking note. Besides the African artists on view at Frieze and Frieze Masters, who include the magisterial South African William Kentridge, African art is on view next week at many other commercial galleries, including the three-year-old Tiwani Contemporary and the brand new Sulger-Buel-Lovell. At Bonhams’s fifth Africa Now sale in May, 10 new records were broken, with Nigerian and Ghanaian artists achieving prices well into five figures. Art fairs in Dubai and Johannesburg have also opened up new markets to African art. But as Ross Douglas, director of the Joburg Art Fair, explains, the key to the transformation has been the beginnings of a local market. Until recently the only country within Africa to have a mature market, of mostly white collectors, was South Africa. Now rising wealth in Nigeria has combined with a growing interest in buying art to stimulate a strong art scene in Lagos, with auction houses, commercial galleries, not-for-profit spaces and the emergence of significant private collections. At this year’s fair in late August, Douglas says, we began “to get a sense of the pan-African art market”. Besides local collectors, both black and white, there were many Nigerians, with buyers from Zimbabwe, Zaire and Ghana, and “collectors were looking for artists across the African continent”. Bomi Odufunade, a Nigerian and the co-founder of art consultancy Dash & Rallo, points out that until recently, in the absence of viable internet, mobile phone or even flight connections, it was hard for collectors and artists to connect across the continent. Today, as an art adviser – to Congolese collector Sindika Dokolo, the lead sponsor of 1:54, among others – she encourages her collectors to start locally, then reach out across the continent to the diaspora and beyond. In her view, “this is more representative of how we have all influenced each other”. Far from being an imprisoning concept, she hopes 1:54 will set both artists and collectors free. LONDON, Oct. 16 (Xinhua) — A major contemporary African art fair kicked off in London Thursday, with dozens of African artists seeking opportunities in Europe and beyond. The 1:54 African Contemporary Art Fair, one of the largest of its kind held in Europe, featured paintings, sculptures, photography and installations. The fair comprised 27 selected galleries representing over 100 international artists from Nigeria, Kenya, South Africa, France, Italy, Germany, Britain and the United States and so on. Inaugurated in London last year, this year’s fair has doubled in size, aiming to expand the presence of contemporary African art in the international market. “For a very long time, there was no role for African art in the international art market, but from last year to right now … countries have the exhibitions done with African artists, so I know it is getting stronger and stronger,” said Touria El Glaoui, founder and director of the fair. Mariane Ibrahim-Lenhardt, director of U.S. based M.I.A Gallery, which mostly presents contemporary African artists, described the 1:54 as a party for Africa related art to join in the international art market. After being around with African artists for several years, she decided to devote herself to creating a market for them. The organizers are also aspiring to take the fair to other parts of the world, particularly in Asia. “The Asia market is curious about everything and it is happening in art,” Glaoui noted. She listed Singapore and Hong Kong as the most probable locations for the fair when it is held in Asia. Apart from the exhibition, the fair has also created an online platform named “Artsy” to help African artists to gain access to the international market. Glaoui said the online platform opened the door for African artists to get in touch with the whole world’s collectors. “For them, it changed everything,” she said. The participants have also voiced their surprise at the diversity of the African contemporary art on display. “Just like the artists from many other parts of the world, African artists are talking about gender, political, social, environmental issues and so on. They are a window of the society,” Ibrahim-Lenhardt explained. “For me, when talk about Africa, it is about the entire human civilization,” said Marcia Kure, a Nigerian artist living in the United States. The 1:54 African Contemporary Art Fair will be held from Thursday to Sunday in London’s Somerset House.